www.massagetherapy.com—your resource for all things bodywork 7 HEAT IT UP! If you have joint problems or a previous injury, you likely do not need convincing that the body has different needs in autumn and winter than in spring and summer. Unfortunately, the scientific evidence of how weather and temperature affect joints and other body aches is conflicting, but the proof of the pudding is in the eating. If the weather is cooler and you apply warm, moist heat to a chronic aching joint, in most cases you will experience soothing relief. So what does this mean for your bodywork session? How about trying heated stone massage; hydrotherapy treatments, such as moist heated towels, a warm foot bath, or moist hot packs; or paraffin wax treatments for providing relief to specific aching joints? While dry heat feels good, moist heat can more easily penetrate body tissues, providing better movement of fluids into, out of, and around the body's cells. With freer movement of fluids in the body, there is optimal chance of circulating fresh, oxygenated, and nutrient-rich blood, as well as lymphatic fluid to boost your immunity. We are nature. 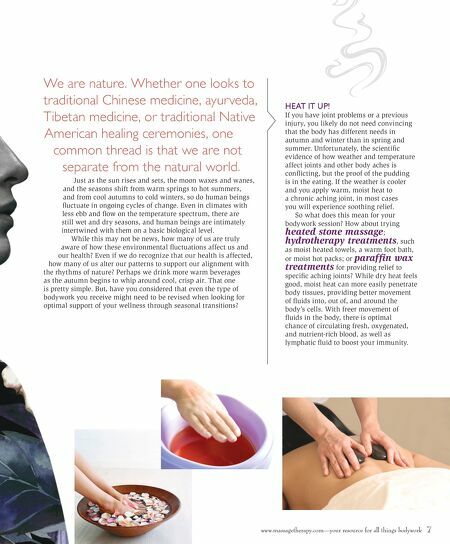 Whether one looks to traditional Chinese medicine, ayurveda, Tibetan medicine, or traditional Native American healing ceremonies, one common thread is that we are not separate from the natural world. Just as the sun rises and sets, the moon waxes and wanes, and the seasons shift from warm springs to hot summers, and from cool autumns to cold winters, so do human beings fluctuate in ongoing cycles of change. Even in climates with less ebb and flow on the temperature spectrum, there are still wet and dry seasons, and human beings are intimately intertwined with them on a basic biological level. While this may not be news, how many of us are truly aware of how these environmental fluctuations affect us and our health? Even if we do recognize that our health is affected, how many of us alter our patterns to support our alignment with the rhythms of nature? Perhaps we drink more warm beverages as the autumn begins to whip around cool, crisp air. That one is pretty simple. 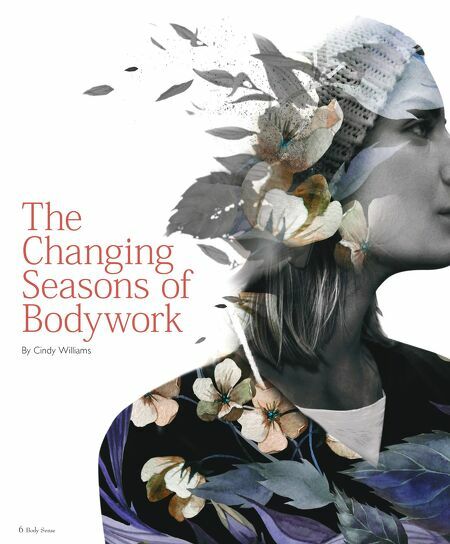 But, have you considered that even the type of bodywork you receive might need to be revised when looking for optimal support of your wellness through seasonal transitions?